One of Godzilla's most brutal and violent opponents. Gigan in his second form - Mecha Gigan aka Modified Gigan! Based on his appearance in the 2004 film Godzilla: Final Wars. 12-inch tall vinyl figure includes his metal armor, open wings, and double-pronged chainsaw arms! Based on his appearance in the 2004 film Godzilla: Final Wars, Gigan in his second form - Mecha Gigan or Modified Gigan - is a 12-inch tall vinyl figure that comes packaged in a closed box. 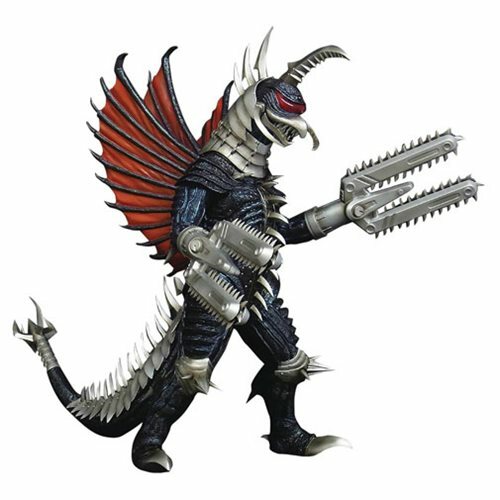 The Godzilla: Final Wars Mecha Gigan 2004 Version 12-Inch Vinyl Figure - Previews Exclusive captures the monster magnificently, including his metal armor, open wings, and double-pronged chainsaw arms! Mecha Gigan is one of Godzilla's most brutal and violent opponents in the storied franchise, and he belongs in your collection. Ages 15 and up.